Bray Wheelers Veteran racers cleaned up at the IVCA awards dinner in Leixlip this Sunday with Mark Murphy, Paul Lee, Robert Magee, Dermot McGrath and Linus Devlin. taking a huge haul of sliver-ware and glass trophies. 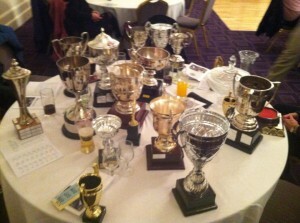 The table was laden down with trophies with room for little else on the table. Congratulations to our veteran racers who have once again done the club proud winning most of the vets time trials and a lot of the road races also. Noel Conway, Jamie Bray, Michael Emberley, Ger Deegan, Anthony Crean, Eamon Walshe were among the other club members who took part in the IVCA league. The youth riders took to the track this week for training at Sundrive velodrome. 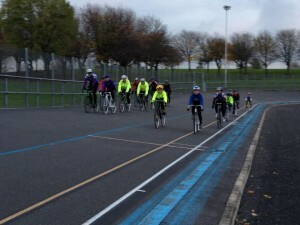 There was a huge turn out of riders for this popular event and for several people it was their first time on a track bike. They all did really well after some expert coaching from Ger Ivory and are looking forward to the next event. The next youth spin is on the 8th December and it is a road spin from Shanganagh Park at 2pm and on Sunday the 15th December is the Bray Wheelers Christmas race at 10am from the Clubhouse. All youth members are encouraged to take part. Fancy dress is encouraged, with prizes for the best costume. There is an entry fee of €5 per person this year and the proceeds from the event will go towards Galen English’s family. Galen was injured recently in a crash while riding his bike, resulting in severe spinal injuries. There is a new club spin leaving Kilmacanogue roundabout at 9.30am on Saturday mornings. This spin will be lead by Kevin Metcalfe and will be rode at an average speed of 22 to 25kph. Kevin is posting details of the spin on the forum in advance so check this out.